Keep your Flares® Earphones safe - they'll last longer. 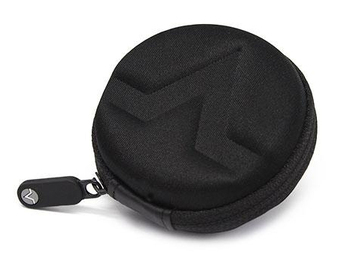 This protective hard case from Flare Audio is designed to give you a nice, secure place to store your Flares® earphones. Don't just toss your poor, naked earphones into your bag and let cruel fate have its way with your expensive electronics. Protect your delicate earbuds with this handy storage case. This hard case features a sturdy outer layer that serves as a protective shell, keeping its contents safe. Mesh pouches line the interior, letting you neatly divide up your earphones and other small items into their own tidy areas. The case provides plenty of room to keep your earphones snugly stowed, as well as space to keep some extra replacement earfoams and other accessories on hand. Having a place to store your earphones is a small thing that is often overlooked, but it can make a big difference in terms of how long your earphones last. If they stay well protected, they stay working longer. Proper storage between uses also keeps the earfoams (the foam tips that actually go inside your ear canals) cleaner and more hygienic.